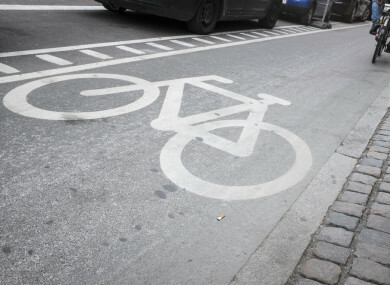 TWO MINISTERS HAVE said they want to ensure greater enforcement of regulations around cycle lanes in Dublin City. At the weekend, Minister Charlie Flanagan, in response to an image of a car parked in a cycle lane on Camden Street, said it was “unacceptable”. Today he told reporters laws around the misuse of cycle lanes need to be enforced and he has spoken to garda management to ensure a better level of enforcement. He said he has been in contact with Minister for Transport Shane Ross and Minister for Planning and Local Government Eoghan Murphy and that he intends to convene a meeting between these departments and other relevant stakeholders. “We have regulation – I believe that it’s light touch regulation – and that’s why I am in contact with my ministerial colleagues. I’m very keen to ensure Dublin City is a safe place for cyclists. Unfortunately, I cannot say that at the moment,” he said. Transport Minister Shane Ross also said he was worried about enforcement. “It is absolutely imperative that cyclists are put at the top of the list, the top queue in priority at the moment,” he said. Email “'I can't say Dublin's safe for cyclists': Ministers want crackdown on drivers parking in cycle lanes”. Feedback on “'I can't say Dublin's safe for cyclists': Ministers want crackdown on drivers parking in cycle lanes”.